by Brianna Crandall — January 11, 2019 — Of interest to facilities managers (FMs) connected with or about to embark on a construction product, two sets of research for the Design-Build Institute of America (DBIA) were announced in recent months that explain design-build (DB) benefits and trends, and provide practical recommendations for delivering successful design-build projects. 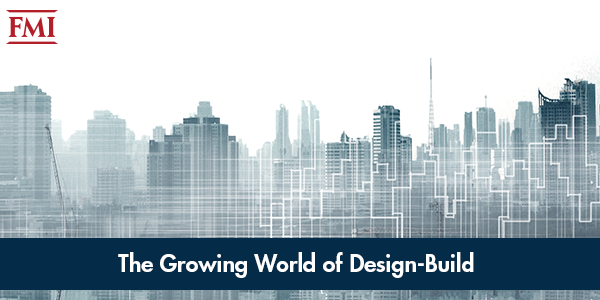 FMI Corporation, a provider of management consulting and investment banking services to engineering and construction, infrastructure and the built environment for over 65 years, just announced the release of its latest research report, The Growing World of Design-Build. This white paper is based on research conducted for DBIA and highlights key trends in the North American design-build market. The author also explains why many owners are transitioning to this project delivery method, and provides practical recommendations for engineering and construction (E&C) firms to set themselves up for successful design-build projects. On track to account for $1.19 trillion in construction spending through 2021, design-build presents opportunities and challenges for the E&C industry. With more agencies adopting the design-build model, the future looks bright for this project delivery method. From an industry perspective, alternative project delivery methods have become a more frequent option for both public and private owners. Design-build (DB) will comprise 44% of construction spending between 2018 and 2021. During this time, DB construction spending will grow by 18% and reach over $320 billion. Geographically, the Mountain (6.3%), Pacific (6.1%) and South Atlantic (6.2%) census divisions will yield the highest DB growth rates between 2018 and 2021. In the DBIA study, experience with design-build was rated highest across all project delivery methods, with 76% reporting very good and excellent experiences. In addition to larger and more complex projects, DB continues to expand into project sizes of less than $25 million, as owners continue to gain exposure to the benefits of the delivery method. To access FMI’s DB white paper, The Growing World of Design-Build, visit the group’s website. Research released by the Construction Industry Institute (CII) in November shows that America’s design-build projects continue to deliver faster, and with greater reliability in cost and schedule performance, than other delivery methods. It’s been 20 years since the seminal CII/Penn State research showed that DB projects consistently delivered projects more efficiently. Over the decades, even as projects have evolved in complexity through many diverse economic cycles, design-build continues to provide improved value to communities, says DBIA. As our nation continues to struggle with the unmet needs of crumbling infrastructure and budgets stretched thin, it’s no surprise that most states have embraced design-build as a better way to deliver projects vital to our economic growth. Whether it’s a billion-dollar airport or small community library, this research confirms design-build continues to deliver innovative projects that save time and money. Design-build is clearly a better way to build. This research was conducted by Keith Molenaar, Ph.D., DBIA, Stanton Lewis Professor and the associate dean at the University of Colorado Boulder, and Bryan Franz, Ph.D., assistant professor at the University of Florida. A total of 212 projects were included, of which: 53 were design-bid-build (DBB), 79 were construction manager at risk (CMR), and the remaining 80 were design-build (DB). A full 62% of these projects were publicly funded, and 38% were privately funded. All projects were completed between 2008 and 2013 and represented a variety of building uses, including: light industrial, heavy industrial, multistory dwelling, simple office, complex office and high technology. Project cost: On average, projects using design-build (DB) cost 1.9% less per square foot when compared to construction manager at risk (CMR) and 0.3% less when compared to design-bid-build (DBB). DB projects also average 2.4% less cost growth than a comparably scoped project using CMR, and 3.8% less cost growth than a project using DBB. Table courtesy DBIA. Click on image to enlarge. Project schedule: Design-build (DB) was the best performing project delivery system in terms of schedule growth, delivery speed and construction speed. DB projects see 3.9% less schedule growth than construction manager at risk (CMR) and 1.7% less than design-bid-build (DBB). They’re also 13% faster than CMR during the construction phase and 36% faster than DBB. From design through completion, DB projects are delivered 61% faster than CMR and 102% faster than DBB. The Revisiting Project Delivery Performance: New benchmarks for unit cost, delivery speed, cost and schedule reliability research summary is available on the DBIA website. Learn how any exposed structural timber in your tall building may affect the spread of a fire May 7, 2018 In "Surveys and Trends"
If you need an outdoor walkway, plaza or retaining wall built, check out this year’s HNA winners December 5, 2018 In "Developments » Industry Awards"